Both are a part of life; however, it's important to know what makes them different and how to foster each type of motivation in their appropriate settings. You probably already have a pretty good handle on what external motivators look and feel like (e.g. money, fame, notoriety, prizes, awards), so today, I want to spend a little time talking about intrinsic motivation. Here are my three biggest takeaways from Drive: The Surprising Truth About What Motivates Us. 1. Intrinsic motivation has three components: autonomy, mastery, and purpose. Autonomy is an innate desire to control your life. Those who have autonomy over their actions are naturally more engaged and connected, and as you'll read in the next section, engagement leads to mastery. Mastery is an innate desire to learn. It's the pursuit of knowledge and achievement, the desire to challenge oneself and put forth effort, to learn for the sake of learning. As Pink observed, we are wired to be "curious and self-directed" (p. 89). Purpose is an innate desire to achieve something meaningful and lasting. This is the "why" behind what we do - why it matters, why it's worthwhile, why it counts for something. Purpose is working for something bigger than ourselves. 2. Rewards aren’t always a good thing. Who doesn’t love a good reward? How can this be a bad thing? It's not that rewards are inherently bad; in fact, as I mentioned earlier, they can be a great motivator in certain settings. But the truth is, rewards "narrow our focus. That's helpful when there's a clear path to a solution,” Pink noted. "They help us stare ahead and race faster. But 'if-then' motivators are terrible for [creative] challenges” (p. 44) because they limit our perspective and ability to think outside the box. earn or receive if you accomplish a certain task. If you do _____, then you’ll get _____. In certain circumstances, rewards can not only "limit the breadth of our thinking,” but also "reduce the depth of our thinking” (Pink, p. 56). When this happens, we tend to see only what’s right in front of us (or whatever gets us to the reward), rather than having a broader perspective or thinking in more creative, innovative ways. Pink indicated, "Many people work only to the point that triggers the reward - and no further. So if students get a prize for reading three books, many won't pick up a fourth, let alone embark on a lifetime of reading” (p. 58). Maybe you’ve seen this in the children you teach each week. Pink observed that “an intense focus on extrinsic rewards can indeed deliver fast results. The trouble is, this approach is difficult to sustain” (p. 79), thus leading to a sudden drop in motivation. Turn ‘if-then’ rewards into ‘now-that.’ You can still give rewards, but don’t make it contingent on the completion of a certain task. Instead, “Any extrinsic reward should be unexpected and offered only after the task is complete” (Pink, p. 66). Make it a surprise and use it to reward good effort, focused work, and creative thinking. Another thing to consider is non-tangible rewards. Social psychologist Edward Deci noted that “positive feedback can have an enhancing effect on intrinsic motivation” (as quoted in Pink, p. 67). Give specific feedback that praises effort and strategy rather than outcome. Offer praise as feedback, one-on-one, rather than in front of a group of people. Offer praise only when it's merited. 3. Intrinsic motivation can be developed over time. Consider ways to flip those ‘if-then’ rewards into ‘now-that’ ones. Does the learner have autonomy over how and when to do assigned work? Does this project promote mastery by offering a new and creative approach to a skill or concept? Does the learner recognize the purpose and greater value of the assignment? Think about other ways to focus on effort and emphasize the learning process over achievement and outcomes. Sometimes, it’s more about the journey than the destination, am I right? When it comes to learning music, this looks like intentional practice, lots of repetition, asking for (and receiving) feedback, and focusing on the most challenging spots. It’s about learning to make music for the sake of itself and finding personal fulfillment in that, more than the small rewards and prizes you earn along the way. 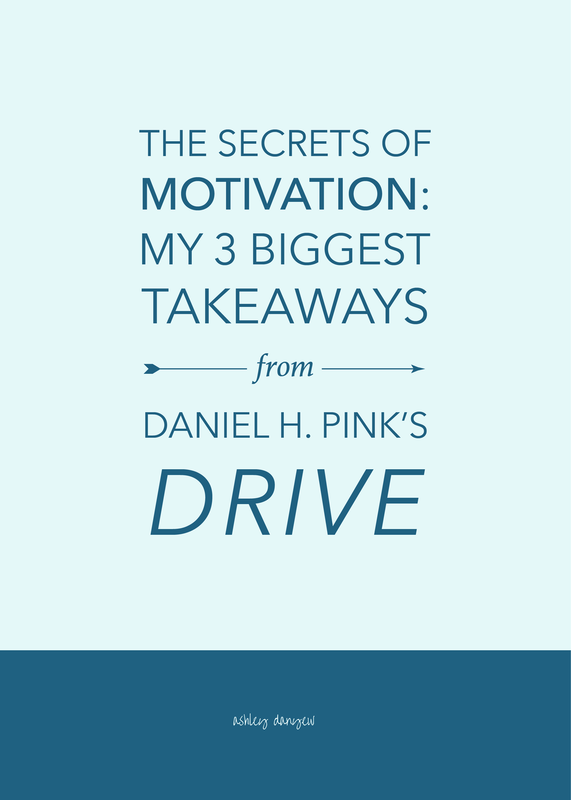 Have you read Daniel Pink’s book? If so, I’d love to hear your thoughts. How do you foster the develop of intrinsic motivation in those you teach?